The Long Road to China: Sunday Snapshot - "Fresh Air With Friends"
Thankfully, by Friday afternoon, the last of us "sickies" in the house, started to feel better and by Saturday morning we were feeling well enough to get up and out. We had plans with my friend Michelle and her two beautiful girls to go see The Lorax, but after the week we had I thought we were going to have to cancel..... I am so happy it all worked out. The movie was cute...all the girls really enjoyed it and even Reagan, who was attending her very first movie, sat through the entire thing without getting antsy or causing a commotion. After the movie ended, we headed outside to let the girls get some fresh air and burn off some of their energy! 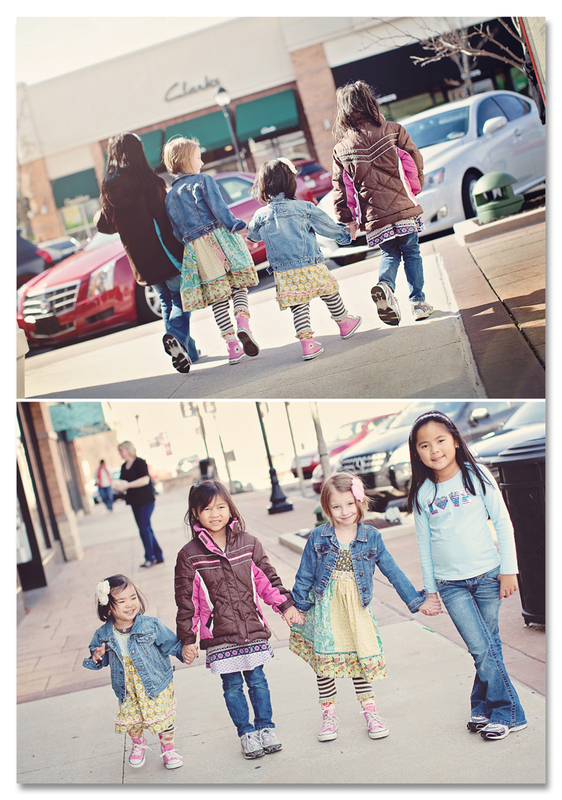 These four cutie-pies caused quite a stir as walked the shops hand in hand. It was such an adorable sight. Reags did her best to keep up with the big girls. At times her little legs didn't seem to move fast enough, but she was determined to keep up. 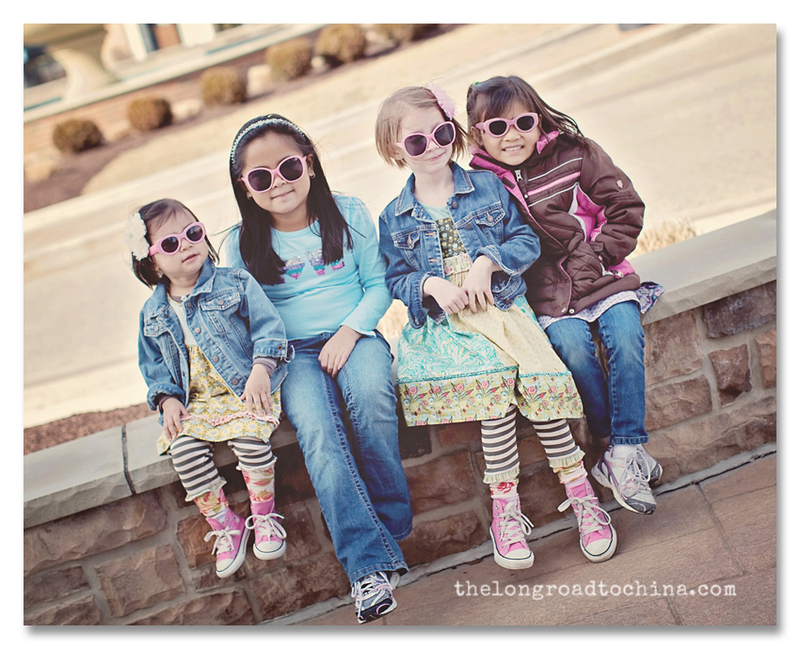 Ten minutes after entering "The Children's Place" our four cuties came out sportin some glam pink glasses! I don't think Sarah ever stopped giggling.... well, until I said it was time to go home. We had such a wonderful afternoon with some very special friends and it was just what the doctor ordered on so many levels. It is supposed to be another beautiful day here in PA so we will definitely take advantage of that and head outdoors this afternoon. what a cute sight for a Sunday morning. Glad you are all feeling somewhat better! Haven't been to your blog in awhile. Gorgeous shots and your girls are so big!!!! What a fun outing! Love, love, love the sunglasses pictures! I am so glad everyone is feeling better! You had quite the long week! This post made me smile BIG!! So glad to see you and Sarah pass the " sickies" and extra happy that Reagan came out unscathed. All the girls are gorgeous! Nothing like a beautiful day and good friends to share it with! Happy Sunday to you!!! I'm so glad to hear you and Michelle had a fun girls' day out!! I remember this past summer when we went to the aquarium and Sarah, Ella and Sophia were inseparable. It was so cute to see them walk around holding hands then and the four of them hand-in-hand today. So cute!!! Oh ... thank you for sharing the smiles! I needed that! 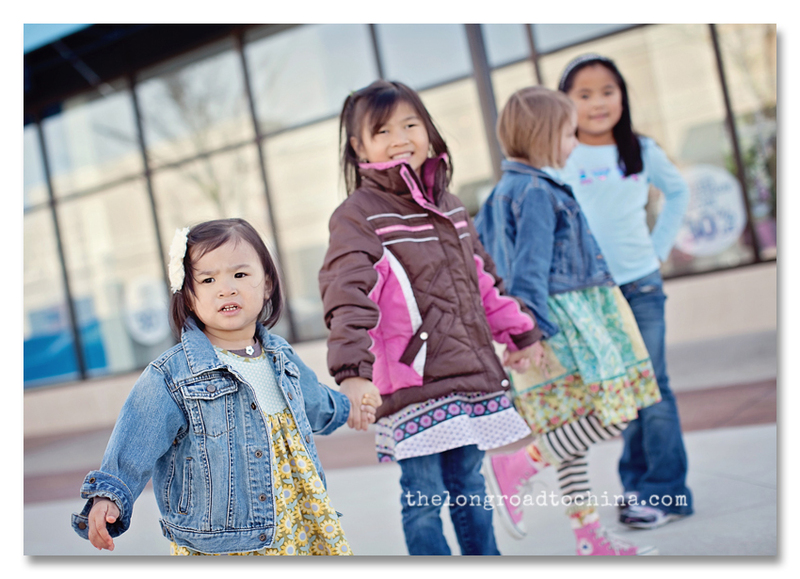 Such sweet friend photos...I love your girls' outfits, always precious! So glad everyone is done with being sick at your house. Yay for sunshine and outings with friends! Looks like a great time was had by all!! They are all so beautiful. And the sunglasses look very pretty on them :) Looks like a great time! What fun movie for Reagan's first. I want to take Chloe but I think she is still a bit to active. How fun! That looks like the perfect way to spend a Saturday. I'm so glad all of you are finally feeling better. 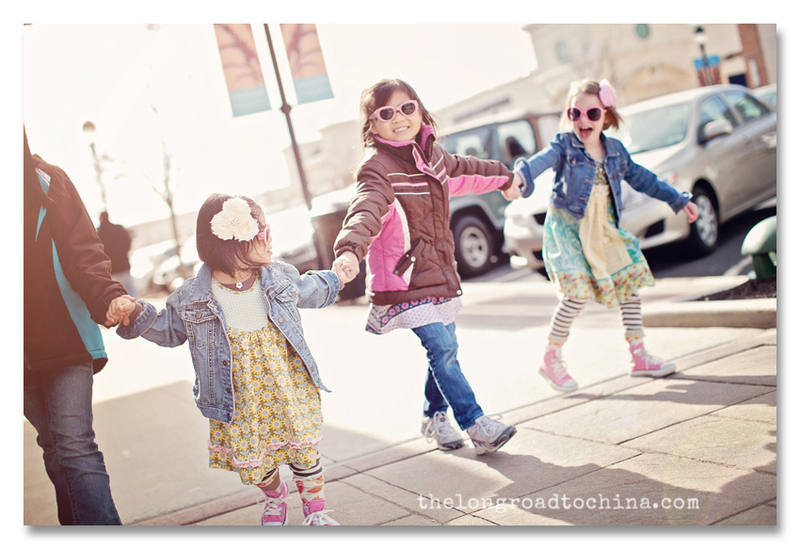 Love the new shades, those are some cool little chicas!!! Wow! So glad you are feeling better! Glad to hear you're all on the mend again. That's sickness is no fun at all! Those photos are fab Lisa, I can imagine those 4 turning lots of heads as they marched along! And the one of them sitting on the wall with the shades is just adorable! They remind me of when mine were little and used to meet up with their cousins, like steps of stairs and partners in crime, lol! these are all so gorgeous! what stunning little girls. Love those sunglasses!! :) Looks like they all had a great time! Love all of these pics. You dress the girls in the most beautiful outfits! Love their style! I know these sweet little girls!!! How precious! All of them in one photo! They are so cute Lisa! Always so heartwarming to see them forming those bonds. What a great day out!